House Ways and Means committee chairman is mulling when to ask for the info. Democrats have for months fired up supporters with the promise that control of the House of Representatives would finally allow them to seize copies of President Donald Trump's tax returns. They have argued the filings could produce a road map for investigations into Trump’s tangle of global businesses and provide a cure for anxiety caused by his refusal to share details about his wealth, debt, charitable giving, and potential conflicts of interests. At one point during the campaign, soon-to-be-House Speaker Nancy Pelosi told the San Francisco Chronicle it would be “one of the first things we do” and “the easiest thing in the world” to demand a copy of the president's tax filings from the Internal Revenue Service. But now just a few days into the new Congress, the leader of the committee, one of a handful of lawmakers legally entitled to access the returns, is urging caution, setting the stage for an early conflict among Democrats about how aggressively to push. House Ways and Means committee chairman Richard Neal, D-Mass., told ABC News Wednesday he doesn’t know when he will request the documents but wants to ensure the committee takes a careful approach to the politically-sensitive issue, so as to best protect their legal position should the president seek to block their efforts in the courts. 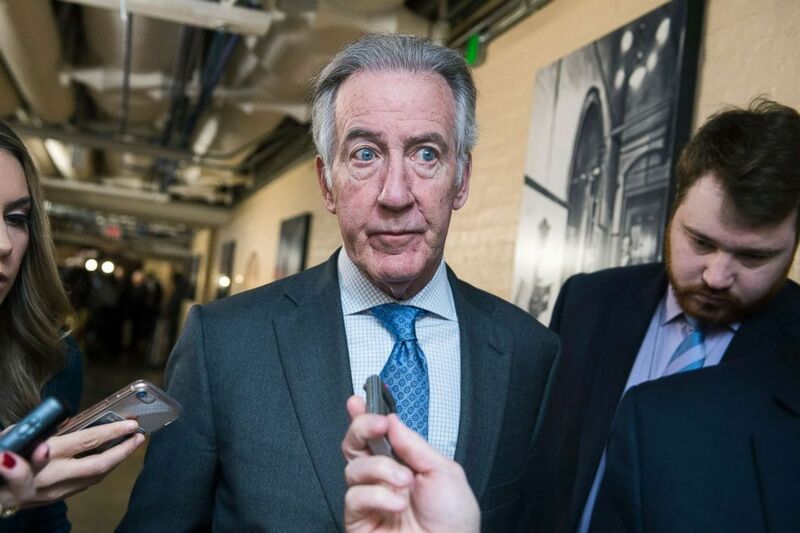 (Tom Williams/CQ Roll Call/Newscom) Rep. Richard Neal leaves a meeting of the House Democratic Caucus in the Capitol, Jan. 4, 2019. "The other side of this is that litigation could prolong it, so we’re methodically doing it the way we said we would," Neal said. Neal added that he still hopes the president will turn over the returns voluntarily. Other Democrats on the panel want to move immediately. The brewing strategic clash in some ways encapsulates a pivotal challenge facing Democrats on a range of topics, including investigations into Trump’s business holdings, subpoenas for Trump insiders, and talk of impeachment. Many have expressed concerns that partisan battles over these matters could overshadow their legislative agenda and feed the perception of overreach House Republicans have been quick to accuse them of on the tax returns and other issues. The call for Trump to make public his tax returns dates back to the early days of the 2016 presidential contest, when then-candidate Trump initially signaled he would gather the volumes of documents that comprised his returns and make them available for public inspection. As the campaign progressed, he dialed back that pledge, citing ongoing IRS audits that would complicate any attempt to make them public. Ultimately, he chose to keep them private. “There’s nothing to learn from them,” Trump said in an interview with The Associated Press in May of 2016. Trump is among the few presidents or candidates not to release his tax returns over the past 40 years. Gerald Ford didn't release his returns in 1976, but released a summary of his returns. Other candidates have released more extensive records. By the end of the 2016 election, three-quarters of Americans wanted Trump’s returns to be made public, according to an ABC News/Washington Post poll. The Ways and Means chairman is one of only three congressional committee heads entitled to request copies. A provision was added to the Internal Revenue Code during a bribery scandal that hit Washington in the 1920s says the Treasury secretary “shall furnish” the tax return of any individual upon written request from the chairman of the Ways and Means Committee, the Senate Finance Committee or the Joint Committee on Taxation. Some Democrats have suggested they attempt a bipartisan route to the tax returns, through the bipartisan Joint Committee on Taxation. But Republican Senator Chuck Grassley, Senate Finance committee, who sits on that joint committee has already signaled that he has no interest in that fight. "I will not go along with efforts to weaponized the authority of tax-writing committees to access tax returns for political purposes," Grassley said on the Senate floor in December. "Such an action would be unprecedented." With the Senate under Republican control, the Democrats have viewed Ways and Means as their only option to pursue the documents. And there is mounting pressure on Neal, not only from within his committee, but from Democrats in other House committees, such as the oversight, intelligence and foreign affairs panels, all of whom see potential value in reviewing the returns as providing potential fodder for their own investigations. While there is no way to know whether the returns will yield anything helpful to those probes, tax experts tell ABC News they are very likely to provide insight into the president’s family business empire. "There really is a lot of information on a return; it is a roadmap to a taxpayer’s financial world – not just the total amount of income, but its sources and types," said tax attorney Christopher S. Rizek, an IRS veteran who now works at the Washington firm of Caplin and Drysdale. "For most items, the return will just provide leads that will require follow-up," Rizek said. Trump’s personal attorney, Rudy Giuliani, vowed on CNN in December to fight any effort by the House to see the returns. Some Democrats have expressed a willingness to wait patiently as Ways and Means gears up for a possible fight with the Trump administration. Rep. Don Beyer, D-Virginia, defended Neal's handling of the delicate political question. "I don’t think he’s timid at all. I think he’s just being thoughtful," he said. But other Democrats note that if the battle grows into long and arduous court fight, the longer they wait to request them, the more likely they miss their opportunity to hold the President accountable before the elections.